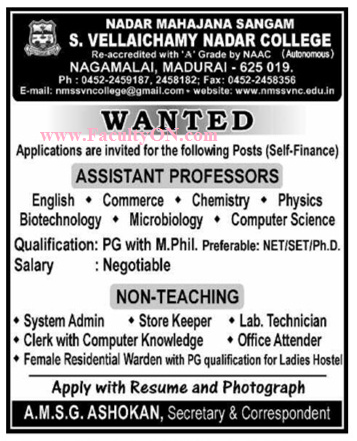 S.Vellaichamy Nadar College, Madurai has advertised in the DINAMALAR newspaper for recruitment of Assistant Professor Plus Non-Faculty jobs vacancies. Interested and eligible job aspirants are requested to apply as soon as possible from 15th April 2018. Check out further more details below. About College: Nadar Mahajana Sangam S.Vellaichamy Nadar College, a first grade college, affiliated to the Madurai Kamaraj University, is situated at the foot of the historic Nagamalai hills on the Madurai – Theni trunk road, spreading over 44 acres in a picturesque landscape. The college was started in 1965 by the “Nadar Mahajana Sangam, Madurai ” with the encouragement of the generous donations received from philanthropic members of the sangam. Kodaivallal, kalvithanthai Thiru. S. Vellaichamy Nadar of Virudhunagar has contributed largely for the creation of this institution by his enthusiastic assistance in all ways. In order to perpetuate his pleasant memory, this college was named after him.